Indians hot shooting stops Tigers in KVAC. 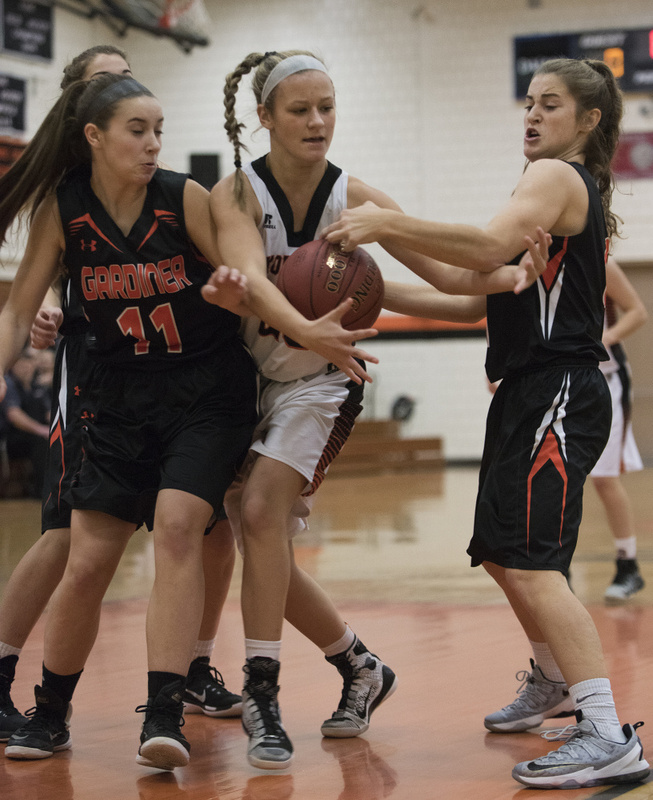 SKOWHEGAN — The Skowhegan girls basketball team shot the lights out, both at the free throw line and from beyond the arc, to beat Gardiner 57-46 on Thursday night and win their sixth straight Kennebec Valley Athletic Conference Class B game to open the season. Sydney Reed and Mariah Dunbar each scored 16 points to lead the Indians (6-0), which scored 16 points off of foul shots. Dunbar made three 3-pointers, while Reed connected on two — accounting for five of the Indians’ seven treys. Mary Toman scored 14 for Gardiner (3-2), while Lauren Chadwick added 13. HAMPDEN 59, LAWRENCE 56: Bailey Donovan’s 22 points helped the Broncos (3-2) rally from a five-point fourth-quarter deficit to win the KVAC A contest in Hampden. Baylee Wildman hit three 3-pointers en route to 13 points for Hampden, while Marissa Gilpin scored 11. Camryn Caldwell and Brooklyn Lambert scored 14 points apiece for Lawrence (2-3), with Caldwell hitting three 3-pointers, while Hunter Mercier added 10 for the Bulldogs. MESSALONSKEE 60, MT. BLUE 23: Sophie Holmes had 27 points and eight rebounds to lead the Eagles to the KVAC A win in Farmington. Ally Turner added 11 points and seven assists for Messalonskee (5-0). Kasadie Barker scored a team-high eight points for Mt. Blue (0-5). TEMPLE 56, VINALHAVEN 39: Kiara Carr scored 18 points to lead the Bereans to the Class D win in Waterville. Selam Heinrich added 14 points for Temple (4-0). Gilleyanne Davis-Oakes scored 18 points to lead the Vikings (4-1) while Paige Dennis had nine. RANGELEY 55, BUCKSPORT 15: Natasha Haley had 18 points, 13 rebounds and four steals to spark the Lakers to the East/West Conference win in Rangeley. Sydney Royce added 19 points and 10 rebounds for Rangeley (2-1) while Brooke Egan had six points and six steals. Kali Litchfield led Bucksport (1-4) with six points. MADISON 69, CARRABEC 20: Sydney LeBlanc scored 21 points to lead the Bulldogs to a Class C South victory over the Cobras in Madison. Madeline Wood scored 14 points and had added six assists, Lauren Hay chipped in with 16 points and six rebounds for Madison (4-1). Bailey Dunphy led Carrabec (2-3) with nine points. ERSKINE 44, CONY 41: The Eagles made 9 of 10 free throws in the fourth quarter to take the victory over the Rams in South China. Catherine Silva led Erskine (1-4) with 13 points and 10 rebounds. Jordan Linscott chipped in with 11 points, while Ally Bonsant grabbed 14 rebounds. Olivia Varney scored 14 points for the Rams (0-5). MT. ABRAM 53, WINTHROP 47: Lindsay Huff scored 15 points as the Roadrunners held off the Ramblers in the fourth quarter in Salem. Sally Stevens added 11 points for Mt. Abram (3-1). Adeline Chaparin scored a game-high 12 for Winthrop (2-3). HAMPDEN 66, LAWRENCE 52: John Wolfington scored a game-high 27 points, including three 3-pointers, as the Broncos won the KVAC A game in Fairfield. Mason Cooper led Lawrence (0-5) with 24 points. Ian McIntyre added 18 for unbeaten Hampden (5-0). VINALHAVEN 52, TEMPLE 50: Cody Hamilton scored a game-high 21 points to pace Vinalhaven to the win in Waterville. Brad Smith scored a game-high 42 points, including a pair of 3-pointers, to lead Temple (2-2). Keon Arey added 13 points for Vinalhaven (4-2). MADISON 70, CARRABEC 24: Mitch Jarvais scored 15 points, one of three Bulldogs in double figures, as Madison won the MVC game at home. Sean Whalen scored 14 points for Madison (6-0), while Nick Morales added 11. Cade Chipman and Alex Stafford each scored six for Carrabec (1-4). BUCKFIELD 50, RANGELEY 48: Jacob Kraske scored 14 points to lead Buckfield to the Class D win in Rangeley. Kyle LaRochelle had a game-high 24 points and 10 rebounds for Rangeley (0-3). WINTHROP 73, MOUNT ABRAM 48: Garrett Tsouprake scored a game-high 21 points to lift the Ramblers to the MVC win in Winthrop. Jacob Hickey added 15 points for Winthrop (4-0). Mount Abram (0-5) was led by Dan Luce with 17 points and Trevor Chaput with 11.